The only thing that Chicagoans might enjoy more than their roasted meats is rock and roll. 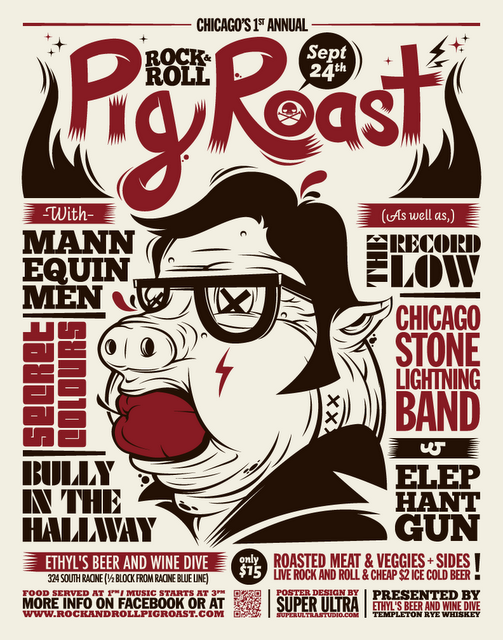 One of the summer’s last outdoor concert events, the Rock and Roll Pig Roast celebrates the windy city’s love for food and music at Ethyl’s Beer and Wine Dive, located at 324 S. Racine, next Saturday, September 24. Aside from the likely delicious food, the event features an impressive lineup of up-and-coming Chicago indie talent. Headlining are the Mannequin Men who’ve made a name for themselves with jangly guitars and pop melodies. The band’s new, self-titled record is set to be released this fall on Chicago’s Addenda Records. Also on the bill are psychedelic-pop quintet Secret Colours, anthemic punk rockers Bully In The Hallway, indie outfit The Record Low, the blusey Chicago Stone Lightning Band and the Americana group Elephant Gun. The Rock and Roll Pig Roast has also released a free sampler featuring the performing bands, which is both streamable and downloadable. Wristbands, which include an all you can eat feast (vegetarian items available), refreshments and music, will be available at the door for $15. Additionally, tickets are available for $10 at the online presale at Rockandrollpigroast.eventbrite.com. The Rock and Roll pig roast is all ages and dog friendly, and doors open at 1 p.m. with the music beginning at 3 p.m. For more information, log on to Rockandrollpigroast.com.